Crazy Score is an adware application that is distributed through third-party file sharing sites. We recommend that you remove this advertising-supported program due to the fact that the developers of this application do not provide the possibility to download it via the official site crazyscore.net. Instead, they rely on third-party installers to spread this application with freeware and shareware programs. As Crazy Score is known to reach target systems in the same way as other unwanted and potentially malicious programs, it is important that you do not trust this program. Better, delete this adware if you do not want your system compromised by malware and other Internet-based infections. The reason why users generally delete Crazy Score from their computers is that this program can flood your browser with unreliable links that might open malicious third-party sites. Also, this program might be taken advantage of by cyber criminals to disclose sensitive data or to lure you into marketing scams. If that is not enough, Crazy Score can also connect to the Internet without seeking your authorization, which means that this program might engage in various suspicious activities in the background of your system. If you keep downloading software from third-party download and torrent sites, it is possible that you might accidentally install Crazy Score in your PC. If that is the case, you need to remove this program right now. Crazy Score is known to be distributed via software bundles that generally consist of a free program and additional applications or utilities. As we are sure you really do not want any unrecognizable programs on your computer, always choose the custom (advanced) installation process, so that you could uncheck the installation of the additional components. Without a doubt, you really do not need Crazy Score on your system due to all the security-related issues this program might present. If you want to delete this program manually, follow our step-by-step instructions below. However, we want to warn you that the manual removal might miss some of the stealthier infections, so equip your system with an antimalware tool that is capable of removing all the threats that might be hiding from you. Press the Windows key + X to open the menu at the bottom left corner of the screen. Choose Control Panel in the menu. 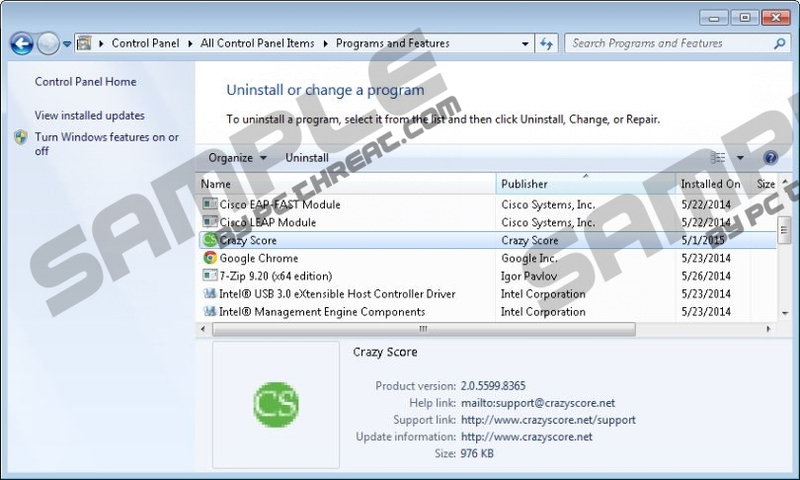 Open Uninstall a program and select Crazy Score in the program list. Click the Start button to open the Start menu, then choose Control Panel. Click Programs, then go to Programs and Features. Select Crazy Score in the list and click Change. Open Add or Remove Programs and choose Crazy Score in the program list. Click Uninstall to remove Crazy Score from your system. Quick & tested solution for Crazy Score removal.